‘Today is my birthday and it’s the first one I ever spent on a train. Arrived Chicago at 1pm. Had a three-hour layover then caught the 4pm train for home. Should be there at 6.35 tomorrow morning. Happy birthday Bill. What a life.’ This is Bill Haley, the great - and some say forgotten - rock and roll star of the 1950s writing in a diary he kept for a few months at the height of his fame. Today also would have been his birthday - his 90th! 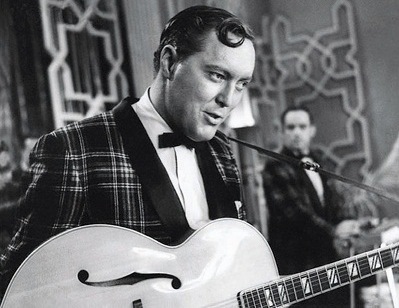 Bill Haley was born on 6 July 1925, into a musical family - his father played the banjo, and his mother keyboards. They moved from Highland Park, Michigan, to near Chester, Pennsylvania, during the Great Depression, but, by the age of 15, Bill had left home and was making money where he could by playing guitar. At some point during the 1940s, he was considered one of the top cowboy yodelers, known as Silver Yodeling Bill Haley. For six years, Haley was a DJ and then musical director of Radio Station WPWA in Chester, Pennsylvania. He married his first wife, Dorothy Crowe, in 1946, and had two children with her. He led his own band - Bill Haley’s Saddlemen - which played at clubs around Philadelphia as well as on the radio. In 1951, the group made its first recordings on Ed Wilson’s Keystone Records. These included a cover of Rocket 88, a rhythm and blues song first recorded by Jackie Brenston and his Delta Cats earlier the same year in Memphis, Tennessee (considered by some to be the first ever rock and roll record). The following year, the Saddlemen changed its name to Bill Haley and the Comets. Success soon followed, with many top 20 hits over the next few years. Already divorced, Haley married his second wife, Barbara Joan Cupchack, with whom he had two children, though only one survived through infancy. Crazy Man, Crazy and a cover version of Big Joe Turner’s Shake, Rattle and Roll were the group’s first big hits; and the latter was the first rock and roll song to enter the British singles charts (December 1954). Rock Around the Clock, said to have been written for Haley, released in 1954, did not become a number one single, on both sides of the Atlantic, until a year later, after it appeared as the theme song for Blackboard Jungle starring Glenn Ford. History has settled on Rock Around the Clock, and specifically Haley’s recording of it, as the key record that brought rock and roll into mainstream culture around the world, thus in time displacing the jazz and pop standards performed by singers such as Frank Sinatra, Perry Como and Bing Crosby. 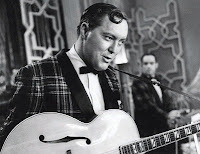 Bill Haley and the Comets continued to record hits through the later 1950s, and Haley starred in the first rock and roll musical films Rock Around the Clock and Don’t Knock the Rock, both in 1956. It wasn’t long, though, before Elvis Presley arrived on the scene, eclipsing Haley, whose life, by the early 1960s, was falling apart: the Comets were in trouble, as was his marriage, and he had problem with tax debts. He fled to Mexico where he married his third wife, Martha Velasco, a dancer. They had one child together. There, he also signed up with a domestic record label, Orfeon, and his group released many songs recorded in Spanish. As the 1960s progressed, Haley toured in Europe with fans keen to discover rock music’s roots, and the Sonet label giving him a lucrative deal. In the US, so-called revival concerts, first staged by promoter Richard Nader in 1969, brought Haley back into the limelight. By the early 70s, Rock Around the Clock was again a hit: re-recorded by Haley for a popular TV show, while the original recording appeared on the soundtrack of American Graffiti. Having been dogged by alcohol problems, Haley’s health deteriorated quickly. After performing in front of Queen Elizabeth II in late 1979 at a Royal Variety Performance, he went on tour to South Africa where he gave his very last performances - a tour to Germany was cancelled. He may, or may not, have had a brain tumour, but his mental and physical health collapsed in the months following, and he died in early 1981. He was posthumously inducted into the Rock and Roll Hall of Fame in 1987. Further biographical information can be found at Wikipedia, in a Guardian re-assessment of Haley as a forgotten pioneer of rock and roll, Rik Hull’s fan site, the Rockabilly Hall of Fame, the Rock and Roll Hall of Fame, or the Pennsylvania Center for the Book. At the height of his early fame, Bill Haley decided to keep a daily diary. Edited extracts were first published (as far as I know) in three editions of the Now Dig This magazine (Nos. 154 and 155 in 1996, covering Haley’s 1956 diary, and No. 166 in 1997, covering Haley’s 1957 diary). Although these diary entries are not available anywhere online, they are quoted extensively in Otto Fuchs’s biography - Bill Haley - The Father of Rock and Roll. This was first published in German, and then in an English language version (900 pages) by Wagner Verlag in 2011. Here are some extracts from Haley’s diary as quoted by Fuchs from Now Dig This. The diary entries for 1957 cover tours to Australia and Europe (inc. England), but Haley’s commitment to the diary is waning by then, and his entries get briefer and briefer.